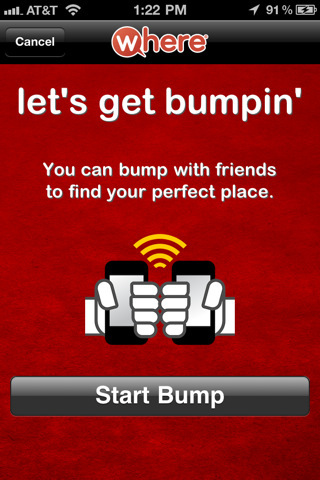 There are plenty of applications on the app store to help you find points of interest in your area. 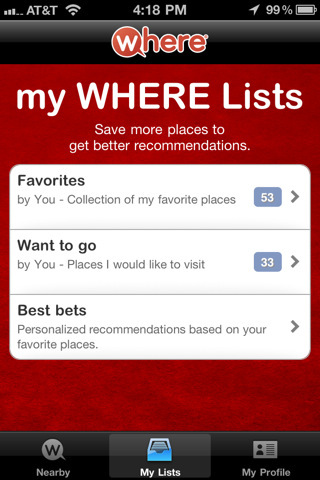 Yelp is the most popular, and other applications like Wikipanion and Articles have implemented location-based services into their feature set. 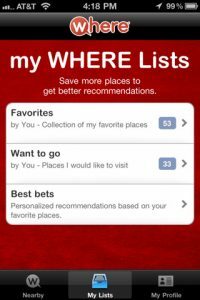 Now, WHERE, Inc. has come along with Where for iPhone, a handy little app that takes the travel and navigation app to another level. 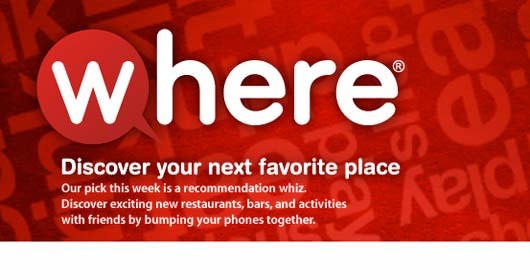 Yes, you’ll be able to locate restaurants, read reviews, and check in using Facebook. 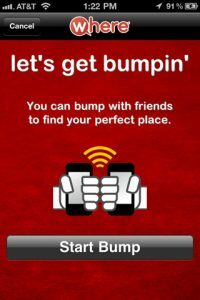 But Where adds a few other incredibly handy features that might inspire you to make it your location app of choice. In order to take full advantage of Where, you’ll want to allow it to use your current location. After all, that’s the entire point, right? Beyond that, if you have a Facebook account, you’ll also want to link to Where so you can import any of your favorite spots, as well as leave reviews and share information with your Facebook Friends list. Once those steps are out of the way, Where really starts to open up. The main menu consists of the basics: Eat, Drink, and Play is where you’ll find your local dining options. There’s also a “Guides” option, where you can browse local guides covering everything from the area’s best thrift shops to the best places to purchase products that support breast cancer awareness. 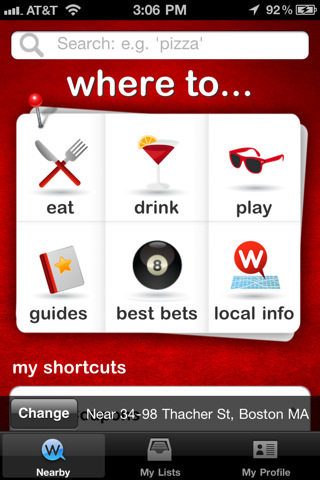 There’s a feature called “Best Bets”, that you can customize by selecting your favorite things. 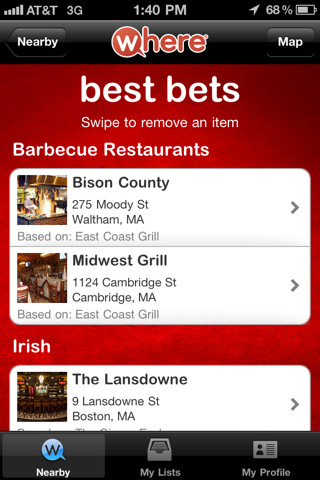 Best Bets will then show you the best local businesses and products that match up to your interests. Finally – and perhaps the most useful – is the “Local Info” menu. This handy tool helps you find ATMs in your area, as well as gas and gas prices, weather, local traffic, and coupons for nearby businesses. This is nothing short of invaluable to travelers and those who are simply looking to plan their day. Users are given the option to add their favorite features of Where to the front page, under a section called “My Shortcuts”. 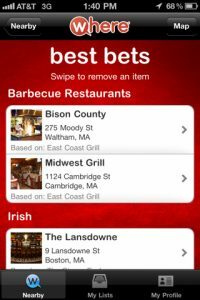 This eliminates the need to search through Where’s exhaustive menus of data and resources, and is a perfect example of how Where excels when compared to other similar applications. The interface is intuitive, and all the information is handy and easy-to-find. There are no intrusive graphics or unnecessary buttons. 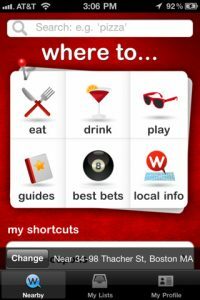 However, because Where is a free app, users will have to deal with the occasional advertisement at the bottom of the screen. Fortunately, if these ads bother you, you can simply tap the “X” and close them. Bottom Line: There is no shortage of location-based applications on the App Store. However, through its handy feature set and intuitive interface, Where is at the top of the heap. Where is compatible with iPhone, iPod touch, and iPad. Requires iOS 3.0 or later.